At Bell, we have many unique and interesting people who work in a variety of positions. As part of a new series, we’re speaking with inspiring people about their career paths and the experiences they’ve had working at Bell. I recently had the opportunity to sit down with Sara Robertson, an alumna of Bell’s award winning graduate leadership program. 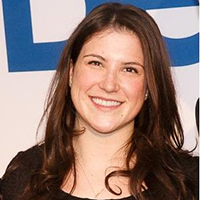 Sara now works in talent acquisition, recruiting for the Bell graduate leadership program. I graduated from McGill University in 2011 with a Bachelor of Commerce degree in marketing and organizational behaviour. After graduation, I started my career at a small national seafood company as a marketing coordinator. This role gave me a good introduction to the business world, but I started to feel as though the position wasn’t challenging me enough. I found out about the Bell graduate program from a friend who worked at the company. After learning more about the program, I decided to apply. I was really interested in the graduate program because it exposes people to different parts of Bell. During the program, I gained a lot of valuable experience working in human resources. I also really enjoyed my experience working in marketing prior to the program. Thus, when a leadership and development position became available that combined my experience in human resources with my passion for marketing, I was very excited. After learning more about the role, I applied, and ultimately got the position! 2. What did you enjoy most about the Bell Graduate Program? I really liked that the program allowed me to try a variety of different roles. I began my program rotation as a customer service representative in a call centre and then I spent three months working as a sales consultant in a Bell retail store. Both of these roles provided me with valuable customer service experience. Then I moved to Toronto where I worked as a leadership development specialist. In my final rotation, I worked as a talent acquisition consultant. These final two positions prepared me for the role I currently have. 3. How would you describe your current role to others? Today, I work as a talent acquisition consultant for new graduates. In my role, I am accountable for interviewing and hiring for the grad program. In addition, as part of my role, I am connecting with recent graduates that are currently enrolled in the program to get feedback on their experience. This gives me the valuable insights that I need to help improve the overall experience of the program for future participants. 4. What do you enjoy about your role? I love that I get to interact with new grads. I really enjoy their energy and passion. I find that I understand and relate to their experiences really well because I’ve lived through them myself. In a broader sense, I love that my job really allows me to be myself. My input and ideas are always welcomed and appreciated—and that is a great feeling! 5. What piece of advice would you give to someone looking to join the Bell grad program? The best advice I can offer to someone looking to join the Bell grad program is not to worry if you don’t know exactly what you want to do. The program offers you an amazing opportunity to experience different aspects of Bell. I often compare the grad program to your first year at university or college. You may come in unsure of what you are going to major in, yet you are given the opportunity to take a variety of courses to test and find out your strengths and what you enjoy. Similarly, the grad program at Bell helps you get closer to figuring out what you want to do, while providing you with the opportunity to network with talented mentors. We hope that Sara’s story gives you insight into the graduate leadership program. To learn more about Bell’s current graduate and career opportunities, visit our career site.